Zen meditation is not only for monks, you can enjoy its benefits too. Follow this simple, easy guide to return to your true nature and find lasting peace. Zen meditation isn’t only for monks, you can enjoy its benefits too! Just follow this guide. The Buddha used zazen to study the self, and to cultivate enlightenment. When using this meditation technique the breath provides the focus for awareness. “Mind and breath are one reality: when your mind is agitated your breath is agitated; when you’re nervous you breathe quickly and shallowly; when your mind is at rest the breath is deep, easy, and effortless.” ~ Zen Mountain Monastery MonksZazen brings body, mind, and breath together as one reality. It illuminates your true nature. It is a profoundly simple practice that is easy to follow. It only requires your intention, attention, and doing it! Your clothing should not restrict breathing or circulation. It should allow the diaphragm to move freely so your breathing can be deep, easy, and natural. Sit like the Buddha (lotus or semi-lotus position). Use a small pillow on the floor to raise the behind just a little, so that the knees can touch the floor like a tripod. Sit in a straight backed chair with both feet on the ground. Keep your spine straight, yet relaxed, respecting the natural curvature of the back. Your eyes are soft focused with eyelids lowered. Your nose is centered in line with the navel, the upper torso leaning neither forward nor back. Mudra, meaning “seal” in Sanskrit, helps focus the mind inward. It provides a wordless connection between your body, deeper consciousness, and the cosmos. To adopt this mudra, use your dominant hand to cradle the other hand, with both palms facing up. Lightly touch your thumbs together to form an oval. Rest your hands on your upturned feet if in a lotus position, or on your thighs if sitting (as with the Buddha image above). Hand gestures activate the same regions of the brain as spoken or written words, found brain research published in the National Academy of Sciences in November 2009. Your hara, the spiritual center of the body, is located two inches below the navel. Imagine the breath coming down into the hara and returning from there. Make it part of the whole cycle of breathing.Count each breath-in and each breath-out separately. Begin with 1 and end with 10, then start over, beginning with 1. For example, breathing in is 1, breathing out is 1, next, breathing in is 2, breathing out is 2, and so on.If your mind wanders to thoughts, just notice them, then let them go and deliberately and gently return your attention to counting breaths starting at 1. Counting helps you focus your attention and know when your mind has drifted off. Each time you return to the breath you empower yourself with the ability to put your mind where you want it, when you want it there, for as long as you want it there. “This simple fact is extremely important,” say the monks at Zen Mountain Monastery, “We call this power of concentration joriki. Joriki manifests itself in many ways. It’s the center of the martial and visual arts in Zen. In fact, it’s the source of all the activity of our lives.”When you’re able to stay with the counting and repeatedly get to ten without any effort and without thoughts interfering, you are ready to begin counting every cycle of the breath. Count each cycle of breathing in and breathing out as 1, the next cycle as 2, and so on to 10, then start all over, beginning with 1. Both the in-breath and out-breath are counted as one unit.This provides less feedback, but with time you will need less feedback. “Eventually, you’ll want to just follow the breath and abandon the counting altogether. Just be with the breath. Just be the breath. Let the breath breathe itself. That’s the beginning of the falling away of body and mind,” say Zen Mountain Monks. Each phase is important and offers its own wisdom.“If you move ahead prematurely, you’ll end up not developing strong joriki. And it’s that power of concentration that ultimately leads to what we call samadhi, or single-pointedness of mind,” say the Zen Mountain Monks. Most often the thoughts that come into your mind are just random thoughts and are treated as distractions.However, sometimes the same thoughts keep recurring, especially if you are dealing with something important in your life.“Sometimes that [thoughts]needs to happen,” say the Zen Mountain Monks, “Don’t treat that as a failure; treat it as another way of practicing. This is the time to let the thought happen, engage it, let it run its full course. But watch it, be aware of it. Allow it to do what it’s got to do, let it exhaust itself. Then release it, let it go. Come back again to the breath. Start at one and continue the process.”Don’t use zazen to suppress thoughts or issues that need to come up. Eventually Zen Meditation brings you to a point of stillness that you don’t even reach in sleep. Here you are your true self unobscured by scattered mental activities and energy that also separate you from others and your environment.It is the natural you, fully alive, fully awake. 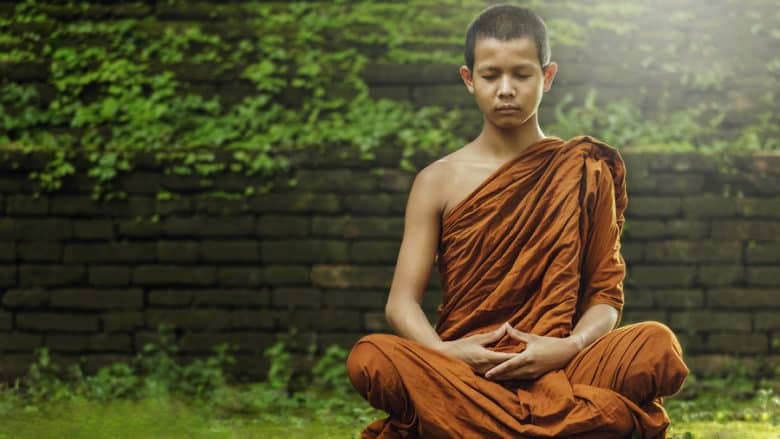 Follow this guide to enjoy Zen Meditation. Its simple method of using the breath, serves a powerful source for natural healing. Come home to your true nature. Come home to lasting peace. Thich Nhat Hanh, Zen Keys, (New York: Doubleday, 1995).